Sari, of The Geek Inside, inadvertently inspired this with a Friday shuffle post. I've noticed a lot of these in my travels -- seven songs, or 10, or a dozen -- some number of tunes that you're listening to right now. But what about songs that make you queasy all over... that make your flesh crawl... that make you look for a blunt object to smash the radio with? There are bad songs in any era; as near as I can tell, bad and worse have cornered the contemporary market. It's so easy to cite horrible songs from the 70's -- anything by Cher, for example (although... at the time... and remember I was young... I kind of liked "Half Breed" or "Gypsies, Tramps & Thieves.") I always hated "Rock On" by David Essex -- yet it's still in heavy rotation on oldies stations across the country today. And anything by Tony Orlando and/or Dawn or by Donny and/or Marie are just too, too easy. So the foregoing aren't truly bad enough, people. We are looking for real, awful, terrifyingly bad tunes. Here are some of my suggestions. After you take your anti-nausea meds, come back in the comments and add your own nominees. Let's strive for consensus here, people! Seasons in the Sun -- performed Terry Jacks -- by Jacques Brel, translated into English by Rod McKuen. We had joy, we had fun, we had seasons in the sun... the heck we did! 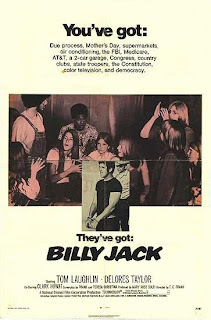 One Tin Soldier -- performed by Coven -- from the movie "Billy Jack." OK, folks, now it's your turn: Do your worst! Additional inspiration for this post, as well as the Sirott baby picture, were found at WLS Musicradio The Big 89 -- a history of the Chicago station during the 1970's. In this Easter-themed bit of silliness the chicken definitely comes before the egg. This post on immigration from Chris at The Partnership for an Idiot-Free America and this riff on speaking English from the Empress Bee got me thinking about the problems of illegal aliens again. I've posted about the subject once before, in the context of proposed minimum wage legislation. But that's not exactly the light-hearted fluff you've come to expect here -- and, as you know, I try and avoid politics in this blog as much as I can. I figure I can offend people without resorting to politics -- and, besides, I don't fit neatly into the pigeonholes of left-wing or right-wing: I'm in the middle of the road -- just where you'd expect to find roadkill. So when I start expressing political opinions, I'm just asking for trouble. So I left long comments for Chris and Bee and was perfectly content to drop the whole thing. And then I saw what our General Assembly's been up to in Springfield and I got right back up on my soapbox again. The rant follows in the next post. We will resume regular programming shortly. The Chicago Tribune reports that the Illinois House has passed a bill that would effectively provide drivers' licenses to illegal immigrants. The document wouldn't be called a driver's license -- it would be a special driver's permit -- but it would allow people who are not legal residents to legally drive on our streets. The bill is not yet law; it is now going to the State Senate for consideration. This is a link to the General Assembly's website, showing the status of the bill and its sponsors. The actual text of the bill can be ascertained by following the links from this site. This is not the first attempt by Illinois lawmakers to deal with the presence of illegal aliens among us. The Consular Identification Document Act, 5 ILCS 230/1, et seq. became effective on January 1, 2006. Essentially this act allows State and local agencies to accept identification cards issued by foreign consulates as proof of identity. Section 10(b) of the Act provides, "A consular identification document shall be accepted for purposes of identification only and does not convey an independent right to receive benefits of any type." Section 10(c) provides, "A consular identification document may not be accepted as identification for obtaining a driver's license or registering to vote." And Section 10(d) provides, "A consular identification document does not establish or indicate lawful U.S. immigration status and may not be viewed as valid for that purpose, nor does a consular identification document establish a foreign national's right to be in the United States or remain in the United States." Thus, the matricula consular issued by the Mexican Consulate can not be used -- yet -- to obtain a driver's license... but it is designated by the State of Illinois as a lawful form of identification. Banks or credit card issuers can accept it. School districts must accept it. The police must accept it as a valid ID. And can you guess a group that is loudly in support of this latest proposed accommodation for illegal aliens? Why police groups of course! This kind of documentation may make fewer drivers do stupid things during routine traffic stops. It may encourage more people to get insurance, to get safety inspections for their cars, it may cut into the black market for phony driver's licenses. I know there are those who fear that aliens -- Mexicans in particular, because of their proximity -- are just colonizing the United States -- just taking over, completely overriding local authority like the barbarian tribes that took over huge swaths of the Western Roman Empire in its last years. But I submit the following to you, ladies and gentlemen: This is just an example of how federalism works -- or doesn't work. The State of Illinois has no right to control who lives here. It has to find ways to cope with the reality that now exists. It is the Federal government that is in charge of the national borders... and... for a variety of reasons... cynical, financial, political, the Federal government does not stop the flow of illegals across the borders. This is not something new. It is not a Republican thing. It is a truly bipartisan national policy: There is a deeply held belief in the most important circles that the steady flow of immigrants is necessary to the health of the economy. Of course, we could change our laws to conform the statutes to the reality that we see around us: To allow those who are sneaking across our borders to come here legally. But -- and here's the rub -- if we did that, we'd have to pay them. Our cynical politicians raise the minimum wage knowing that some Americans will lose their jobs because of it -- knowing that the pool for teenagers and other legal entry-level workers will shrink -- because there are plenty of Josés and Marias out there who will work for $4 an hour and never dare ask for a raise. And some people blame the illegals. I don't. I suspect that most immigrants today -- even the illegals -- are not fundamentally different from those of our grandparents’ time. They come here to become Americans. To build a better life for themselves and their children. It's us — we Americans — who are different. We don't want to give up our cheap lawn care. Or live-in nannies. We like dining out -- a lot -- so much that restaurants are springing up on every corner. Who's washing the dishes? Who's busing the tables? We don't care who's cleaning the stores at night. We're bargain conscious: If José and Maria will do these jobs for $4 an hour -- or, better still, $3.50 -- we say hooray. We complain that not all immigrants learn English. And they don't. But I know I could never acquire real fluency in Spanish (I speak the John Wayne dialect) -- even if I were to move tomorrow to Mexico City. 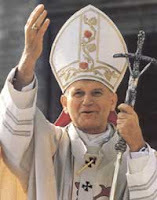 The late Pope John Paul II was a gifted linguist. But not all of us are. The real problem is that we -- we Americans -- do not insist that the immigrants' children learn English. We Americans are squeamish about imposing our culture on people who come here. Hello? Why do you think they came? They came to be part of our culture -- just as your grandparents did. I do not believe that immigrants coming here today want to recreate Poland or or Pakistan or Mexico or Ghana on these shores. Although I’m sure there may be exceptions, for the most part, they want to be Americans, just as our grandparents did. But Americans don't seem to know what an "American" is anymore. We -- we Americans -- no longer celebrate being American (without hyphens). We celebrate our diverse heritage instead. When my kids were in the Catholic grammar school, they were each (in turn) given an assignment: Write about your heritage and put "your country’s flag" on the cover. And the first time it happened I tried to dig in my heels. You can write about your Irish ancestors or your Cuban ones, I said, but you put the Stars and Stripes on your cover because that's the flag of your country -- but that would only have gotten the child in trouble. So when today's immigrants keep their languages and customs, at least at home, aren't they doing what the other Americans are doing? What the other Americans are taught to do? Particularly when we do not "force" their children to learn our language. We -- we Americans -- are creating these foreign-speaking ghettos; we are creating rootless, stateless populations with whom we can not even communicate directly. We must work through intermediaries -- "community leaders" -- some of whom are leading the parade to keep kids from learning English... because, if they did, they might learn they didn't need those "leaders" any more. In the 60’s we finally faced up to the fact that not everyone was included in the great American "Melting Pot." And we overcompensated and overreacted: Instead of mixing in the missing ingredients, we have settled for an increasingly lumpy stew. We all became hyphenated. We can't blame immigrants for that. And we can change. America is not just a place. It is an idea -- an ideal, actually -- that an opportunity to get ahead in the world is available to all. We need a common language to share this idea, so that all Americans can participate equally -- and not through intermediaries. Did you know that English was almost rejected as our national language in favor of German? It was a close thing -- but, at the time of the Revolution, England wasn't nearly as popular here as it is now. So it's not that English is so special. It just happens to be the language of our country. People come here to become part of this country need to learn -- to the extent they can -- the language of this country. They need to demand and insist that their children learn the language so that they can fully participate. And as for controlling the borders? Let's enforce our immigration laws already on the books and put employers in jail for knowingly hiring illegals. When the CEO's of Fortune 500 companies start trading in tailored suits for prison overalls we'll see a true reduction in the demand for illegal workers. If José isn't sure that he'll get a job in the meat packing plant, he won't risk his life crossing the desert. If that really hurts our economy, well, then we'll have to look at our immigration policies again, won't we? Just another service provided here at Second Effort: According to an AP story by Matti Friedman that I saw in this morning's Chicago Sun-Times, the Isreali Green Leaf Party, a pro-marijuana party that has never quite elected anyone to the Knesset, is warning its supporters,"You shouldn't smoke marijuana on the holiday, and if you have it in your house you should get rid of it." Friedman reports, "Biblical laws prohibit eating leavened foods during Passover, replacing bread with flat crackers called matza. Later injunctions by European rabbis extended those rules to forbid other foods like beans and corn, and more recent rulings have further expanded the ban to include hemp seeds, which today are found in some health oils -- and in marijuana." Passover starts Monday evening. Guide yourselves accordingly. When Alan Greenspan spoke, strong men's knees buckled, and the markets rose or fell. 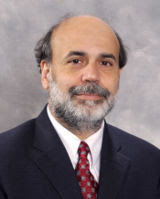 Now the Fed has a new chairman, Ben Bernake. But the results are the same: Mr. Bernake testified on Capitol Hill this morning and the market tumbled in response. Greenspan was famed for his obtuse language. What will we say of this new Chairman? That he speaks to us in the Bernakular? 5 hits, 2 runs (both earned, although there were two errors behind him). And one more important number from yesterday: 30 degrees. That's how far the temperature plummeted in the Chicago area during the course of the afternoon -- from roughly 70 to 40. And the wind -- which was driving the temperature down -- made it feel like 20. And this all happened in the space of a couple of hours. Let's put it this way: Only immediate family would come out for a game like this... and after Middle Son was pulled for a reliever in the 8th, we watched the rest of the game as best we could from the car. Youngest Son got to come with yesterday; he was free because his baseball coaches are in Florida this week for a "coaching clinic." Somehow I'm certain that some beach time has been built into the coaches' schedules. Younger Daughter didn't come with... she got home from school after we left. She was initially miffed that she didn't get to see (and be seen by) the college boys... but as the weather deteriorated, she quickly got over it. I have another overdue project and I did wear myself out yesterday and I want to leave early today because Middle Son is supposed to start the second game of a doubleheader this afternoon at a local college. Rain is, of course, predicted. Bee asked after my health in a recent comment. Long Suffering Spouse and I went to see the surgeon a week ago today. It was our second visit to the doctor's office since I'd been released from the hospital. We went the first time because my wounds were oozing something and we didn't know if this was a problem. When we called to inquire, the doctor told us to come in -- but two seconds after looking at it said it was perfectly normal. So that was good. Even better, the surgeon had just that day received the pathology report from my surgery. They'd biopsied everything in sight. They may have taken samples from a couple of the spectators in the OR. But they couldn't find anything else to work on -- so that means no chemo, no radiation, no nothing. So we went into last Monday's scheduled appointment with a good attitude. I was hoping to be cleared for work. You may recall that, by last Monday, I'd even gone to court once, for a settlement conference. It had knocked me out for a day and half afterward -- but I'd done it. We actually didn't see my surgeon last Monday; we saw his young apprentice. I think the young doctor may be given a lot of the follow up work -- so that Dr. P. (who really is good at what he does) can do more of it. The young doctor asked a few questions and seemed pleased by the answers -- but he balked a bit when I asked him about going back to work. "This was a major operation," he said. "You really need about six weeks to heal up." "Doctor," I said, "while we were waiting to see you, your receptionist called me up to the window. She handed me a bill and asked if I'd brought my checkbook. Well, I didn't -- but the point is, Doctor, do you want this bill paid or not?" The young doctor considered the question for only a moment. "Well," he said, "you can try going back to work and see how it goes." I'm still taking pain pills and I'm still not allowed to drink alcohol. That's no way to go through St. Patrick's Day, let me tell you. And I have to wear suits because they have a higher waist than even my Levis-for-old-fat-people (a/k/a Dockers) and my middle is still swollen and tender. The doctor suggested that suspenders (instead of a belt) might be more comfortable, and he was right. And there are other issues, still, but I'll spare you the details. I made it to work three days last week. I worked a full day Friday, the day I finally finished that brief. Thanks again to all who've sent me their good wishes during my recovery. Sari, of The Geek Inside, ran a Dilbert cartoon this morning... because it made her laugh... and that's not always easy on a Monday morning. Now, why do you suppose this cranks me out of shape? Chris from Thermal posted a link to a site where I found this. Whitesox.com is running a countdown clock to Opening Day; as this is written, we are only eight days, 13 hours and a few minutes to the first pitch of the home opener against Cleveland. Now, I am a devoted White Sox fan and have been since I was a little boy. I remember falling asleep listening to Bob Elson on the radio, broadcasting the games for Friendly Bob Adams and Household Finance. And even though I've lived on the Northwest Side for 25 years, I've stayed a Sox fan, raising all of my children in the one true faith. Allegiance to a baseball team is not something you change with the fashions. It is infused in your bones and your sinews and your synapses. It is part of what you are and who you are. Our beloved Go Go White Sox -- and whoever plays the Cubs. On Opening Day, everyone is in first place. Even the Cubs. This year, Cub fans have particular reason to be optimistic. They have a new manager, Lou Piniella, and their team has spent the gross national product of a small country on free agents. But some things don't change: Kerry Wood and Mark Prior will probably start the season on the disabled list. 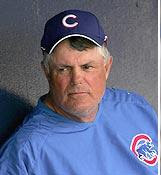 And poor Piniella -- who looked so tanned and rested last year on the Fox baseball broadcasts -- will probably melt down before Memorial Day. Because team allegiance is encoded in your DNA, reasonable Sox fans don't mind serious Cub fans. Because they can be just as serious as any fan of a real baseball team... no, wait, let me rephrase that. Oldest Son graduated from grammar school in 1999 -- during the Cubs / Sox interleague series. We were invited to a graduation party that day at the home of true blue Cub fans. The grandmother of Oldest Son's classmate, a German immigrant and a sweet lady on almost all other occasions, was (and is) the most fanatical of the bunch. We arrived late to the party, because we had a delay at the restaurant. So we had a chance to see the game that day... and the Sox won... sweeping the series as I recall. I walked in and said hello to our hosts and then went in search of the grandmother. I said hello to her. "All I said was hello!" I protested. "Ja," she said, "but I know vat chu vas thinking!" For her sake, I hope the Cubs do well this year. It would even be wonderful if the Cubs made it to the World Series... as long as they play the White Sox. But let's not get ahead of ourselves: It's time to savor the arrival of Opening Day. And the hope that springs eternal... every Spring. Besides, if you're in the same boat I am, Opening Day is all we have to look forward to: My NCAA bracket is toast. I learned something from yesterday's posts: I had no idea that this plague of bicycle helmets was so widespread -- and that it had even become legally entrenched in various jurisdictions of the body politic. As a lawyer I understand that I have a rather highly exaggerated sense of risk.... Let me put it this way: Engineers look at a device or a situation and think about how it can be made better. A lawyer looks at the same device or situation and thinks about all the terrible things that might happen. I've always thought this was so because lawyers become involved when things go badly, not when things go well. I once had a case where I defended a 7-year old who was riding a Schwinn Stingray at the time of the accident. He must have just gotten the training wheels off because he was five at the time he allegedly ran over the three year old plaintiff -- who'd darted out of his suburban driveway on a Big Wheel. Well, no one can see a Big Wheel -- they're so low to the ground -- and our young plaintiff was lucky that he was hit by a Schwinn and not by a car. Because of this case, I resolved that my kids would never have a Big Wheel... and they never did. And we've never had wallpaper either because many years ago I represented a mother who lost two children in a house fire just before Christmas. It was a bleak, rainy December day and my client had gone over to the church -- barely 10 minutes away -- to pick up her older daughter. Mom left her four and six year old sons at home -- why bring them out on such a crumby day? -- but as soon as she left the boys decided to go prospecting for Christmas gifts. One of them found a lighter. They climbed chairs in the dining room to get a look at the top of a china cabinet. Somehow one of them lost their balance... the lighter ignited the drapes... and the children ran and hid. It's an instinct, I've since learned, a remembrance of our animal past: Children will hide in closets or under beds when there's a fire -- they don't think to leave the room or the house. Children have to be taught to try and escape a fire; otherwise they will automatically (and often tragically) seek refuge instead. The fire spread from the drapes to the wallpaper; burning pieces of drape fell on the carpet, and it also burned. But there was no conflagration. The fire was out by the time mom came back -- but only because the fire consumed all the available oxygen in the well-insulated suburban house -- and the boys were found, suffocated, under one of the beds. The father, as representative of the estates of the children, sued the manufacturers of the wallpaper, carpeting, drapes, and lighter -- each of whom in turn sued my client, the bereaved mother. No, we've not had wallpaper in our houses. I realize that I see the 'dark side' of everything -- but I also realize that you can't have a viable, vigorous society if you are constantly trying to insulate everyone against every conceivable hurt or mishap. Now why can't society see this, too? How do we draw lines here? ...and sometimes a picture cries out for a caption. The cartoon mentions lawyers. The photo is a detail of an ad for title insurance appearing in this month's issue of the CBA Record, a magazine for Chicago lawyers. Presumably the girl is happy because her parents have wisely protected the purchase of their new home with title insurance. Even the training wheels and dorky bicycle helmet are probably intended as symbols of protection. Hey, it's title insurance: You gotta get visuals where you can. But I looked at this picture and thought, you know, if the girl's parents had spent less time obsessing over title insurance and more time teaching their little girl to hold on to the handlebars when she rides her bike, she might not need to wear the dorky little helmet. The use of the adjective 'dorky' may (perhaps) give away my views on the subject of bicycle helmets. 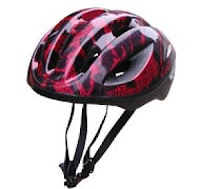 Certainly, I can appreciate that helmets would be useful accessories for bicycle racers or persons who ride their bicycles on unpaved trails. But this little girl is on her way to visit her friend Zuzu Bailey, two blocks over, so they can compare rose petals. Why does she need a helmet for that? No wonder kids today won't get off the couch and go out in the sunshine and play: If they do, someone may strap a dorky helmet on them! It seems as silly to me as safety posters and guardrails on the scaffold. My kids (now 14 to 23) never wore helmets. My perception is that none of Youngest Son's contemporaries wear these contraptions but that many of the younger kids do. In fact, in my neighborhood I have seen entire family groups riding their bicycles in the nice weather, each wearing a sillier helmet than the next -- even mom and dad! When did this become the norm? An Unscientific Survey on this subject follows immediately. This seems an appropriate question on what is allegedly the first day of Spring: Do the children in your life (children, grandchildren, nieces, nephews, etc.) wear bicycle helmets when they go out riding? All the time? Or under what circumstances? Do you wear one when you go out with them? Do you wear one when you ride on your own? Shelly left a comment on one of my recent posts that her husband, Chris (not to be confused under any circumstances with Steph's husband, Chris) had nominated me for a "Thinking Blogger" Award. Yesterday I found that I've also been nominated by Doctor Anonymous. This award/meme originated with this post on the thinking blog. ...Please, remember to tag blogs with real merits, i.e. relative content, and above all - blogs that really get you thinking! Sometimes, when I'm clicking "next blog," my thought is "how can this person say things like this without going to jail?" -- but, even that constitutes thinking, of a sort. And every blog I visit regularly 'gets me thinking' -- otherwise I wouldn't visit. So I've been agonizing on this for some time now: How do I come up with a list of only five? And then there are the rules: What constitutes "real merits" and "relative content?" It sounds rather pretentious to me. Landgirl of Home in the Highlands. Right after Landgirl first stopped by this blog she asked a question that is still something I think about all the time: "Are you writing for publication or to have a conversation with interested people?" For me, this is like asking if I want cookies or ice cream: My answer to both questions is "yes." But these twin goals are not always compatible. Landgirl's essays are interesting and thoughtful, and strongly evoke what is, for me, a very different and foreign place... and lifestyle. Ben and Bennie, of A Work of Art: Raising Our Exceptional Son. Bennie's opinions and reports are newsworthy, too... if you'll recall his recent foray into cable news. Mary Anne, of A Place I call Home. Oh, sure, you'll find updates on the family and photos of knickknacks and (gorgeous) photos of the local scenery... but you'll also find her tackling thorny issues, like When is a lie a lie?. I'll make Ken Levine's blog my fourth nomination. Not that he'll notice. This guy is truly big-time: Just read his profile. And how can a guy have such a great career as a writer and have broadcast major league baseball? Ken Levine's blog gets me thinking, every day, about how insanely jealous I am of him. But he's very funny and worth a regular visit. Chris, of Thermal, is my final nominee. He's not given to long or introspective posts -- but he's constantly looking for gadgets and widgets and other geegaws to drive traffic to his blog, only some of which I've been brave enough to steal emulate. Unless your blog is just a diary that is only coincidentally left out in the open where anyone could find it, you're probably writing in the hopes of being read. How do you accomplish this? Chris is working on this, and he writes about it regularly, and it gets me thinking. Somehow I doubt that St. Patrick would approve of the celebrations that mark his feast day here in America. And, while I know there are people in New York or Boston who might disagree, there's no place in America that takes St. Paddy's day quite so seriously as we do here in Chicago. People might think our enthusiasm for St. Patrick's Day is a legacy of the many Irish politicians who have dominated public life here for so very long -- but there's a lot of cities which have been blessed (or cursed) with Irish-dominated political machines. But I think the biggest reason for our particular enthusiasm is the proximity of the good saint's feast to the political primary date. We say that everyone in Chicago is Irish on St. Patrick's Day -- and sure they are, if only to muscle their way to the front of the parades and be seen by all the voters. I've marched in a few of the parades, both Downtown and in Beverly, over the years, and seen a few more besides. 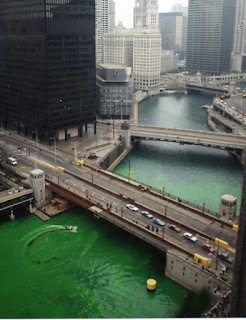 And, yes, they do dye the Chicago River green for the occasion. My first St. Patrick's Day Parade was in 1977. Richard J. Daley had just died the previous December and the parade was to be dedicated to his memory. Someone mentioned that our student group could march with one of the North Side ward organizations if we would build a float. I'd stuffed my share of napkins into chicken wire building floats for high school homecoming parades, so I was enthused by the prospect. Someone else said they knew of a flat wagon that could serve as the platform for the float; he was sure we could get it, use it, and return it before the Park District even knew it was missing. Because I was the elected head of the invited student organization (and only for that reason) I was included in the party which had to see the Committeeman to confirm our participation. Since the Committeeman was the one who invited us in the first place, we didn't have to sell hard to secure his permission to join in. He had only one question: How many people will you turn out? "Well, sir," I hemmed and hawed, "A lot will depend on the weather -- we'll surely have more if it's a nice day. And it is right before midterms week; that could hold our numbers down." The Committeeman regarded me with the pitying look that one might give the hopelessly addled. He spoke slowly this time: How many people will you turn out? I opened my mouth -- but one of the people who was there 'with' me -- he was a member of both groups and had been the original conduit for the invitation -- spoke before I could make a greater fool of myself. "250," he said. I didn't say anything until we were safely out of the meeting and on our way back to school. "What possessed you to promise 250 people?" I asked. I may have used a few additional words for emphasis. "It'll be alright," my friend assured me. "He just needed a number." He explained: It wasn't an important number -- like how many votes you'd turn out in your precinct on election day -- it was just a number. We had very elaborate plans for the float. These plans became less and less elaborate as we attempted to execute them. By the wee small hours of the morning of the parade we had scaled back our ambitious design by 80% or more -- and we still weren't done. Still, it was decided to move the float to the staging area in the hopes of finishing it there. In those days the parade formed up north of Wacker Drive, north of the Chicago River. We were assigned a spot on Clark Street. Today this area is the very trendy, very expensive River North neighborhood. There are new skyscrapers everywhere -- hotels, office buildings, condominiums. But that's not what it was in 1977. Still, we got the float done, on time, although the borrowed platform had exhibited a distressing tendency not to turn when circumstances dictated. Crowds of revelers descended on the staging area as soon as it was light, increasing in number and degree of intoxication as the minutes ticked by for the parade to begin lurching down State Street. There was only one relatively deserted spot -- by our scaled-back float. "250? 250? What are we going to do when we don't have 25?" As if miraculously, however, minutes before we were to being what looked to be a lonely journey down the parade route, shuffling along in disgrace, hundreds of students showed up. I have no idea where they'd been. We just had time to form them up a little. I'm not talking about military precision here -- it was more of putting those people who seemed to having trouble standing up straight into the middle of the group. But at last we were ready to go down the street, and just in time, too. And when the float pulled away from the curb, what should remain behind but a small mountain of beer cans? I don't remember where the parade pulled off of State Street -- but our borrowed float platform balked at this one last turn. We wound up at some place -- I think it was called Charlie's -- well south of where we were supposed to be. I hadn't slept. I was relieved that we'd not done anything really stupid in the vicinity of the reviewing stand or the TV cameras. And I was ready to celebrate with a drink, even though I figured I'd probably pitch forward in a coma upon contact with alcohol. But adrenaline kicked in moments after entering the tavern: I noticed everyone was carrying guns. My panic attack ended, however, when someone pointed out that we were across the street from Police Headquarters -- 11th and State. And I still have the ribbon that was given me that day -- as a parade 'marshal.' I'm holding it up to the screen now. What do you think? Isn't it nice? My blog friend Barb recently mentioned that my posts tend to be a little, well, looooooooong. And although I hope that all of you will hang around for every polished syllable, Barb, in a very nice way, suggested that there are only 24 hours in a day. Shorter posts might make it easier for people to visit and comment. Anyone who has lived with teenagers will be familiar with this picture. No amount of wheedling or cajoling or harping or nagging seems to change the teenager's habit of leaving the toilet paper roll empty. Even leaving a ready replacement in plain view doesn't work. But it occurred to me that we shouldn't be asking why teenagers won't replace the roll. Maybe we should ask, instead, how is it that, no matter how little is left, they seem always able to make do with what's there? This is the first stanza of Samuel Taylor Coleridge's poem, "Kubla Khan" -- or, more completely, "Kubla Khan. A Vision in a Dream. A Fragment." See, I haven't wandered entirely off topic... yet. I am taking a medication called Norco for pain management during my (seemingly interminable) recuperation. It was explained to me that Norco is like Vicodin -- a lot of Tylenol and a lot of morphine. Indeed, there's supposed to be more morphine and less Tylenol in Norco than there is in Vicodin. From looking around the web, it appears that this may be an oversimplification: Hydrocodone seems to be the really potent stuff in Norco but it is apparently not actually morphine derived from the opium poppy; it is a substance that is considered equivalent. I've seen it referred to as an "opioid," defined as a chemical substance that has a "morphine-like" action in the body. Whatever it is, it's working. I'm not having any whacked out visions of stately pleasure domes... but that's only because I'm still having pain and the medicine is blocking that. But it does make a body more verbal. Tuesday, I snuck into the office for a court appearance. I've not been cleared to go back to work, and, indeed, because I'm still swollen from surgery, I had a difficult and painful time just getting dressed. Without revealing any confidences, my client is in worse shape than I am -- I'm getting better -- so I had determined, from the day I scheduled my surgery, I would move heaven and earth to attend this one conference. Long Suffering Spouse was concerned that, with the drugs I'm taking, I might not be mentally up to the challenge. "What will you have to do?" she asked. Don't worry, I told her, I don't need to do anything other than say pay me some money. My client was late getting to the office Tuesday and another attorney who had an interest in the proceedings, and who was supposed to meet us at my office, called from the expressway to say he'd have to meet us at the courthouse instead. I got to the office early because Long Suffering Spouse drove me there before sunrise. That way she could get to her own job on time. And I would have time to recover from the trip and review the file. I did review the file. And the cases that support my position. And the cases which interpret the statute that controlled my case. But it was like pulling teeth. I was having enormous difficulty focusing. I answered some emails, returned some phone calls, opened the snail mail. And then I would turn back to the task at hand again. And again. By the time the client arrived, we were already assured of being at least five minutes late. I had already called his cell phone to make alternate arrangements -- but I had received no answer. He wanted to walk across the Loop to the Federal Courthouse. I hadn't walked half so far since my surgery. But we walked. Getting through security was interesting: My client had a pain pump and the guards initially thought it was like a fanny pack that he could remove and run through the x-ray machine. He had to show them it was attached.... And I was concerned about the staples that had been used internally to hook up the new plumbing arrangements. Would these set off the alarm? And where would they try and put the wand to find them? Fortunately, the surgeon's prediction was right: They did not set off the alarm. The court still had a criminal matter to dispose of when we finally arrived. And then the judge wanted to lock the courtroom because of a pro se litigant who'd taken over the attorney's room across the hall and was wandering around too freely for the judge's taste. You can appreciate that our Federal judges here are a bit skittish in light of recent tragedies. "I don't think this guy will be violent," said the judge -- as his court reporter locked us in -- and he retired to chambers to look over the file quickly. "As a plaintiff," I then told opposing counsel, "I always think it's a good sign when the judge locks up the parties before the settlement conference begins." The pain medicine did not cloud my judgment Tuesday -- because I was walking on familiar ground. A friend of mine is trying to get me involved in a new case of his and I'm very concerned -- not being familiar with these new facts and not being as conversant on the relevant statutes and case law as I was in a case I'd been working on for almost two years -- that my judgment in the new case might not be as good. And I have paid dearly for my outing Tuesday evening and yesterday. In the meantime, there's another new matter I really want to read today before I fade again. Even though I still haven't spun the anecdotes I intended to spin as I sat down to compose today's entry. That focus thing is still not happening, is it? * Text and note obtained from the Electronic Text Center of the Library of the University of Virginia. Here is a link to the entire poem. An author's note originally published with the poem also attributes the text to a vision received under the influence of an "anodyne." 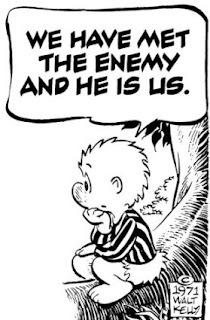 I believe this was the official motto of Dow Chemical -- and it certainly is the unofficial motto of so many of those who grew up in the 1960's and 1970's. Actually, I was never a part of the "drug culture." Certainly not like two of the fellows on my dorm floor in undergrad. These two roommates retreated behind their door on the first day of school, put out a couple of incense burning trolls -- similar, as I recall, to the one in the picture -- and smoked dope all day and all night for the entire year. I don't recall them ever coming out to eat or use the bathroom, although I suppose this must have happened. Because they didn't die in there: There was a constant supply of new smoke to testify to that. And somehow the incense was replenished. The incense, you see, was to throw any suspicious persons off the scent -- quite literally. 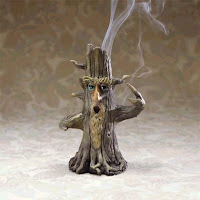 Why, you'd never suspect that someone burning incense was also burning marijuana! At least the users thereof seemed to believe that -- proving that dope does indeed scramble your brains. I will confess that I was present on a couple of occasions when marijuana was used. One instance in particular comes to mind: The pre-meds were cramming for the MCAT, the test that would determine if they could get into medical school. In those days, the MCAT included a section on general knowledge -- things that you might have picked up from history or culture if you ever took your nose out of a biology textbook. In short, this was the absolute hardest part for most of these guys -- and the reason why I was there even though I was probably in my first year and they were all seniors. I thought it was just trivia, but the older students were truly amazed that I could spout correct answers on so many varied topics. So I felt useful and helpful. After a long day cramming, the pre-meds thought it was time to relax. So we adjourned as a group to someone's room. I had no particular enthusiasm for what I knew was about to happen -- but I will admit to a certain curiosity. One of the kids pulled the curtains shut. We were in a high-rise dorm, you understand, but there was apparently always the chance for aerial surveillance or something. Another set up an incense stick and lit it so that no one could tell we were going to burn something else as well. (Have I emphasized strongly enough that these guys are probably all doctors now?) Someone else provided a towel to put under the door. Eventually, after all of this preparatory ritual, a joint was produced and lit and passed around. It was not a magic moment. What I particularly recall was excusing myself after a time to answer Nature's call. I was standing in a stall and one of the pre-meds was in the adjacent stall. He asked, "Are you high?" I don't know, I said. "Well, I think I'm high. Yes, I must be high. Are you high?" It was soon after this point that I bade a good evening to this rather tightly wound bunch of pre-meds and repaired to the nearest tavern. Beer and whiskey were far more legal and one could have far more intelligent conversations than "Are you high?" Well, the conversations seemed more intelligent at the time. This essay started off as a piece about the medications I took in the hospital and those that I'm currently taking. Not that you could tell: It appears that I've wandered off topic again. It may be the medications I'm taking, eh? Youngest Son is running the brackets pool in his junior high homeroom. Another (lesser known) loop is closing in the Circle of Life. Back when I practiced with a firm, I was the commissioner of our annual basketball pool. It was a big pain in the neck -- certain people always seemed to hold back on putting in their $10 until the first few games were played. As if those first few games would establish an absolute trend that would provide assurance that their entry fee would come back to them. Then there were a couple of others who always seemed to stall getting their sheets turned in until the last possible moment... maybe even after tipoff of the opening games... but, honest, no, they weren't checking scores or anything. Heaven forfend! The firm opened up the pool for secretaries, the clerk, friends and relations -- but not for clients. Never clients. We wanted our clients to believe that we were far too serious to engage in frivolity of this sort. And no client ever investigated the truth of our claims, so far as I know, probably because they were all too busy with their own pools. The winner of our pool would get at least half the prize money; the balance would be paid out to the next few finishers. I don't think we ever arrived at a set pattern on this, but I think the pattern may have been that, if I ever came close to finishing 'in the money,' we'd cut back on the number of winners for the next year. There was only one certainty about the prizes from year to year: No one ever wanted to actually win our office pool. Winning came at too high a price. In a strange combination of the principles of March Madness and noblesse oblige the winner was expected to plunk his winnings on the bar of a nearby tavern so that we could all celebrate his good fortune on his nickel. Now, you will have noted that the language in the foregoing paragraph bespeaks an assumption that the winner of our pool would always be male. And you may say that this is a sexist assumption. And, of course, you'd be right. But, you see, the assumption cut across gender lines. Starting the party was the only real way to induce the female staff into putting their own sawbucks into the pool -- they also assumed they could not win, but this way everyone stood to get something out of the deal. And, in the harsh world of real-life experience, this random, sexist assumption worked out... badly. There are two basic ways to prepare for the task of completing your NCAA brackets. First, you can study all year long, starting with (as we did at my old firm during some of the early years) publications like Street & Smith's pre-season analysis. Then you would watch every game, read every article, consult every oracle (including the post-season record of every tournament team). After all this, you'd lock yourself in seclusion, pausing to neither eat nor sleep until each game you'd resolved each and every game, as if in a vision. Your completed bracket would be drenched in sweat... but steeped in unquestioned expertise... and you would surely be assured of staying in contention for the prize until about the conclusion of the first weekend of tournament play. Second, you can pick teams at random. By just guessing you can almost certainly be assured of staying in contention for the prize... until about the conclusion of the first weekend of tournament play. One year the pool was won by a secretary who made her choices on the basis of which team had cuter uniforms. Another year the pool was won by a female associate who based her choices on which city she preferred to visit. Texas Tech is playing Boston College this year? She'd decide whether she'd prefer to visit Lubbock, Texas or Boston, Massachusetts and choose accordingly. Picking which team has the cooler nickname is usually not a successful means of handicapping the tournament, although maybe the playing field is leveled this year with the absence of the ultra-cool fighting Spiders of the University of Richmond -- or the Vandals of the University of Idaho -- or the Banana Slugs of the University of California Santa Cruz. Now that I'm self-employed, the concept of the office pool does not appeal to me nearly as much as it once might: Sure I'd win -- but I'd also finish last as well. I've toyed with the notion of entering Youngest Son's pool in the junior high... but I don't think I can stand the humiliation. And I don't follow college basketball like I used to. I saw players like Kevin McHale and Larry Bird when they were in college -- up close from the first row of the bleachers in a small gym. But it was a different game then: Without a shot clock, an undersized, less talented team might give a stronger, talented team a close game. The underdog might actually win on occasion -- if the undersized team had the patience to work the weave. The Four Corners. The Stall. But when the weave would be broken by an athletic steal and resulting fast break, the fast break was louder and more wonderful than ever it could be in an exchange of dunk for dunk or trey for trey. The same people who thought the Four Corners was boring probably think a no hitter is boring in baseball. But I'm starting to rant again, aren't I? Go back to picking your own brackets and I'll get back to you tomorrow. Jyrki Kasvi is a Finnish MP standing for reelection -- that means he's gotten elected at least once already! -- and he's taking no chances about ignoring any possible constituency. According to a Reuters story posted Friday on Yahoo! News, Kasvi is having his campaign site translated into Klingon. The article says Kasvi's website is www.kasvi.org. I have dutifully provided the link, but it does not appear to work. Don't complain to me -- take it up with Yahoo! News or Reuters. But I don't want to single out the Finns unfairly. Reading this story brought back a distant recollection of something I saw at Malnurtured Snay's site. Yes, this is an American Member of Congress going on about "Klingons in the White House." Coincidence? Or conspiracy? Hmmmmmmm. 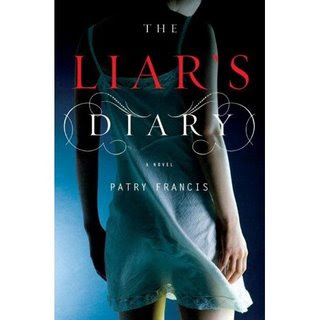 I've already written about my pre-surgey shopping expedition to buy Patry Francis' new book, The Liar's Diary. In that post I said that I'd started the book already, even though I bought it to read while recuperating; as it happened, I also finished it before going into the hospital. Yes, it's a page-turner: You'll not want to put it down, particularly as the plot gets rolling. You may start by thinking that this is a book about an unlikely friendship between Jeanne and Ali. Jeanne is the respected and efficient high school secretary; mother of a troubled teenage son, Jamie; and the wife of Gavin, a respected orthopedic surgeon in a nice New England town. Ali (short for Alice) is the new music teacher at the high school -- and so much more besides. She's a composer, a musician, and the wife of George, once a famous trial lawyer, now teaching philosophy at the local college. But The Liar's Diary is not really a book about friendships; it is a book about secrets. Corrosive, even deadly, secrets, layers upon layers of them. Hmmmmmm. An anonymous blogger reviewing a book about the perils of secrecy: My delusion is under attack! The problem with reviewing a book that one likes -- and I liked The Liar's Diary -- is that one either talks too much about the plot and spoils the book for others or that one talks too little about the plot and doesn't leave the reader of the review with any incentive to pick up the book. George is a cuckold: Ali and George have lived apart for some time as the book opens, and she is carrying on an open and notorious affair with the local car dealer. But George loves her in spite of her unfaithfulness; he remains devoted and protective of her -- and when something happens to her, he is determined to see justice done. Is he just a wimp? Now why would a novelist invest that kind of affection in George if that's all he is? George isn't a wimp. He understands that the secret of Ali's past made her into who she becomes. He is wise, and his intuition is sound. You'll see some of the secrets coming when you read The Liar's Diary -- but I'm willing to bet you won't see all of them. Once I thought I had figured out one character's secret. I was waiting for Patry to prove me right. It was like waiting in the train station at the wrong end of the platform: The plot didn't even start braking until it passed my position. Now, the secrets in The Liar's Diary are dark and terrible -- not usually a subject for an entertainment, even in a mystery, which requires a certain amount of criminal behavior in order to exist. But Patry is not using dark and unspeakable crimes to 'entertain'; the most horrific action takes place off stage. Rather, Patry is concerned with the consequences of the terrible secrets more than with the terrible secrets themselves. And we can be swept up in, and, yes, even entertained, as we reveal the secrets and their consequences. I was. Nurses -- or -- There goes another fantasy! MJ, the proprietor of Nurse Ratched's Place, has the best collection of pulp paperback art... and she regularly shares selections with her readers. I didn't fully realize, until my recent hospitalization, that none of these covers feature the beautiful nurse and the aging, but still attractive, patient. Yes, several of the nurses who tended to me during my recent hospital stay were very attractive. But I was fully cognizant that I was anything but attractive: I had one IV pumping pain medicine into my back, another pumping nourishment into my arm, and a Foley running... well some of you know where these run and what they do. I don't believe I've ever had the dubious pleasure before; Long Suffering Spouse thought I might have been thus rigged up once before. The human mind can suppress almost anything. The tube was disconnected! I didn't know what had popped off; I assumed the worst. But the nurse did not lose her cool. She immediately figured out the problem, lifted the footrest, moved the offending tubing and restored the status quo ante. There is apparently some sort of snap couple joint where the tubing coming from... you know... joins up with the tubing going to the bag which fills up with... well, the point is, that the rupture had occurred at this joint, and nowhere vital. Eventually, they were able to coax me down off the ceiling. The Fire Department rescue was cancelled. Anyone so concerned obsessed with the integrity of his various external tubes was not going to transform into a gowned Lothario when Long Suffering Spouse turned her back. And I didn't smell very good either. Still, I got along well with the various nurses and nursing students that rotated through. There were a couple of things I noticed: First, there wasn't a whole lot of continuity. I was in a regular room for five days and I did not have the same nurse, on any shift, more than three times. You may be inclined to attribute this to the intervening weekend -- but that's when we finally had our first repeat nurses. The other thing I noticed was how busy the nurses appeared to be. The frequent intercom calls for "lifting help" at one room and then another were one clue. Then, last Friday, when I went through the accelerated course in toilet re-training, I was instructed to ring for a nurse to come and, uh, inspect my efforts. This did not happen right away (OK, I wouldn't want to go look either!) -- but I was ready to make my next, uh, donation a couple times that day before anyone could get back to me. That was the longest day for my wife. During the course of the day I figured out how to get into and out of the bed by myself and how to move myself and my equipment to where it needed to be. I had altogether too much practice. By midnight, I'd persuaded Long Suffering Spouse that I could handle it on my own. And I did... but by the third time I was up on my own that night, I needed to ring for help... just to get untangled. Help was promptly forthcoming on that occasion and deeply appreciated. Necessity will trump modesty any day. Long Suffering Spouse was concerned that the staff did not appreciate her frequent presence. I said it was just the opposite: She was able to assist me with the unpleasant personal tasks, leaving the staff free to focus on other patients who did not have the advantage. Long Suffering Spouse did not interfere when the nurses came in to do their things. She got out of the way and only asked if there was anything they needed her to do. I can't imagine that this would annoy anyone. I, on the other hand, did annoy one nurse. She was puppy-praising me for cooperating with whatever shots she was then administering. This was nothing special, I said, since I was trussed up in the bed like the Thanksgiving turkey in the roaster pan and she had large needles and other means of enforcing obedience. Apparently she thought I was suggesting that she would intentionally injure me if I didn't cooperate. And I suppose I was... as a joke. It wasn't much of a joke to start with, and one I'd assume most nurses have endured before, but this particular nurse's response just killed it entirely. Nurses: Was I that far out of line? And what do you think of spouses who remain on station as Long Suffering Spouse did for me? I had this tremendous shoulder pain when I was installed in my new room. I attributed it to pulling muscles in the course of my thrashing about trying to find a comfortable position on the undersized SICC bed. The PM nurse in my new room made a couple of efforts to scrounge a heating pad -- one leaked as soon as it was started, creating an electrical shock hazard -- it's eventual replacement never got above room temperature. My wife grumbled that she could have gone across the street to the grocery and procured a heating pad in far less time than we wasted in these efforts. But, after she left for the evening, I was awakened by a young surgical resident. "I understand you've been having shoulder pain," he said. His "understanding" could only have come from our nurse that evening; she'd sent him in to talk to me about it. He explained that this was a 'referenced pain' -- and if that's not the correct technical term, it's my fault recollecting and nothing else. He explained that the way the body is 'wired' it sometimes sends pain messages from areas that aren't really in pain -- thus the arm pains reported by some heart attack sufferers. The arm isn't really hurting, he said, but the pain in the arm signifies the heart attack for purposes of diagnosis and treatment and is therefore helpful. My pain, he said, could be of this type: Air had to be introduced into my chest cavity in the course of this operation; it would eventually dissipate... but I might experience phantom shoulder pains in the meantime. I felt tremendously better for having this visit and I'm grateful to the nurse for having set it up. By Saturday afternoon I had been disconnected from enough tubes and wires that I could put on a robe. Long Suffering Spouse accompanied me on a walk around the unit. The nurses' station was not immediately adjacent. The SICC was in one corner of the unit; it seemed a much longer trip from there to my room when I was riding on a bed. Was it only a week ago yesterday? I found it amusing that at every step of the pre-surgery process, someone else was asking me to verify my name and address. Now I can understand that we would not want to amputate the left leg when it was the colon scheduled for surgery. And I heard they had 15 operating rooms up and running at my hospital the day of my surgery. So some verification that the person moving to OR4 was the right person for the procedure therein set up was certainly appropriate. But they asked so many times! Did they think this was the ACT and I had sent someone in my stead to take the surgery for me? At one point I asked, "Aren't these the kinds of questions you should be asking me when I wake up?" The surgeon stopped by, the anesthesiologist stopped by, nurses were introduced, a medical student introduced herself -- she'd asked to watch -- and I began to wonder if the room would be big enough to hold us all. And, of course, I got to greet these various well-wishers in a lovely purple paper gown that had openings where warm air hoses could be attached. I didn't notice how warm these made the gown until the air got shut off. Then Long Suffering Spouse was told where she should go and wait; she could check in my clothes there. It was to be a long wait: We were told to expect a five hour surgery; it was not yet noon. Maybe it was the comments that some of you left on earlier entries, but as I was wheeled into the OR, the first thing that I noticed were the cameras; something, presumably a recording camera of some sort, was suspended from the ceiling bearing the legend "DVD." So DVD's will be on sale in the lobby after the show, I asked? Actually the cameras make it possible to tie in surgeons or medical students from around the world for an operation, even to the point of participating: After all, my laproscopic surgery was more "on screen" than down and dirty. But, alas, my colon was not sufficiently interesting to attract the attention of surgeons from around the world. So, in belated response to those who asked: There are no pictures to share. ...And I awoke in Recovery. Alone, as far as I could tell. But I could see a clock. It said 6:35 pm. Roughly seven hours from when I was taken in -- not five. We're late -- something must have gone wrong. I may even have felt for a bag. I wasn't supposed to get a bag. But I may already be embellishing here; these were simple, quick thoughts. And if I was briefly alone, it was only briefly, because there were soon people commanding me, in no uncertain terms, to stop thrashing about. I wasn't in sharp or stabbing pain, but I was decidedly uncomfortable and I was shifting about for a comfortable position. At least, that's what I thought I was doing. But everything I did unplugged something or twisted something else that was better off plugged and untwisted. I was eventually wheeled to the Surgical Intensive Care Center -- a 'step down' unit. Various explanations for my stay there were provided, namely, the surgeons were being cautious in my case because of the lengthy surgery or, alternatively, they had no other place to put me at the moment. I tend to the latter explanation. On the way to the SICC I heard someone call my name. It was Long Suffering Spouse; she'd been moved to a waiting area nearby in anticipation of my arrival. I made some visible acknowledgement -- I may have tried to lift my head or something futile as this -- so that the person pushing me asked, "Is that your wife?" Yeah, I said. The SICC consisted of approximately six curtained off areas facing a nursing station. There was room, in my little cubicle, for a bed and a chair on either side, one being where Long Suffering Spouse set up camp and the other a recliner where I was supposed to transfer my flag just as soon as my strength permitted. There was a small TV that could be swung down in front of the bed so I could watch it. I spent one night and nearly all the next day in that little area before a room was located. I did not have occasion to socialize with my neighbors. I would not have wanted to socialize with the guy in the next cubicle in any event. He spent a great deal of time issuing demands -- he wanted the name of the hospital president at one point. At other times he asked for his medications -- not those prescribed for him at the hospital but those which he'd left behind at home. And another gentleman on the unit apparently passed away in the night -- just a couple of curtained cubicles over. I can appreciate that the hospital may not have been interested in disclosing to those of us in the vicinity that someone arguably similarly situated had embarked on a journey to the next dimension -- but I heard him termed "Code Blue" and even if I didn't have some sense of what that meant, I would have figured it out from the tones used by persons using the phones at the nursing station. But back to my neighbor: Early in this crisis, as the group is laboring to pull someone from the edge of the precipice, men and women were calling out the dying man's name. Over and over. Trying to call him back. My neighbor was mocking them. "He's gone already. He's not here. Why don't you let the rest of us sleep?" I cringed. Well, I was already cringing. I cringed more. There's only one bit of good news about this guy, and I found it out from my wife this morning. It seems that, one time while I was asleep, my neighbor went on a rant about needing his cell phone. Cell phones weren't allowed because of the heart equipment on the unit; the proximity of each of us to each other wouldn't have recommended the usage of cell phones in any event. Undeterred at being told he couldn't get that, he wanted the phone number of the unit. He had big deals waiting for him. He had to check his accounts. It seems he was a stockbroker. Long Suffering Spouse and I have been blessed with five children. When the delivery of each of them was imminent, my wife hoped to receive "an epidural." This was the magic medicine could transform the stress and strain of labor into a truly blessed event. You see, each time, Long Suffering Spouse's labor progressed so rapidly that the moment in which the magic epidural could be safely administered came... and went... and on each of these occasions Long Suffering Spouse, her face twisted into a mask of pain and rage, cried out, "DRUGS!! I WANT DRUGS!!!" So we arrive at the hospital last week for my surgery, and we began to learn some of the details. The anesthesiologist explained that I would have an epidural. "It's the Cadillac of pain management," he said. He looked like he's about Older Daughter's age. "I wouldn't know," I told him, "but I think to keep peace and harmony in the family, I'd better not." I briefly explained why. "It just figures," said Long Suffering Spouse, playing along. I think one of the nurses was becoming concerned that we were really going to veto the suggested anesthetic. I was forced to disclose my allergy to penicillin at every step along the way. But the thing to which I'm most allergic is pain! Did they think this would help? Then I was wholly and sincerely in favor of it. I'll have to figure out how to square it with Long Suffering Spouse some other way. Deciding to have surgery is only the beginning of the process: Sure, you want the surgery... but does the surgeon want you? And there was one thing that I for sure wanted. 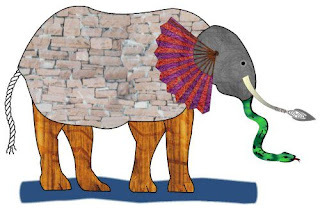 I tried to explain this to the surgeon: You'll recall the story of the three wise men sent to investigate the elephant. The problem with the wise men was that they were all blind... so the one man felt the elephant's side and thought it must be a building... but his colleague grabbed a leg, put his arms around it, and pronounced it a tree... and the third, feeling the moving trunk, determined that they had happened on a snake. Well, I wanted to make sure that this business in the colon was the proper focus of our our inquiry: I wanted to be certain we had the entire elephant in view! Dr. P. was way ahead of me (once he finally figured out what the heck I was talking about); he'd already prescribed a full abdomen and pelvic CT scan. He was quite confident that it would turn up nothing new or unsuspected... but this would provide reassurance about this elephant thing. All of these tests had to be done by the Monday before the scheduled February 28 surgery; otherwise the surgery would be put off. So the CT scan was duly scheduled for Tuesday morning, February 20, and my physical for the evening of the same day. Dr. P. also specified an additional blood test he wanted the internist to run and, as luck had it, the internist has a phlebotomist available on Tuesday mornings for blood draws. So I'd go from the hospital to the internist's office for the blood draw... then to work... and back to the internist, this time with Long Suffering Spouse in tow, to get the physical and discuss the outcome of the CT scan and the various blood work. With one predictable exception, it all worked without a hitch. I fasted as required for the CT scan, drank the required fluids at the prescribed times, and left the house within a few minutes of when I was supposed to leave... all because this was carefully overseen by Long Suffering Spouse. I had no particular difficulty with the CT scan itself. Some people become apprehensive at being slid into the giant donut shaped machine. I, on the other hand, having been offered a place to lay down, am far more likely to sleep than fret about it. However, I'd been warned that when something -- a dye, I presume, or a reactive agent that turned the mass quantities of stuff they'd made me consume into a dye -- was 'infused' through my IV I might feel a strong urge to urinate. Actually, I hadn't drunk so much liquid in so compressed a time frame since my nightclubbing days -- and the technician handed me still another dose as I sat down on the bed of the machine -- I thought I already had an overwhelming urge. In this, as in so much else in the days to come, I was mistaken. Thankfully, the timely warning (both from the technician and from Older Daughter the night before -- she has a friend who's recently undergone this under far more serious circumstances than my own) provided me with just barely enough resolve to complete the procedure without committing a serious breach of social etiquette. I left for the internist's office as soon as I could, pausing only to... well, I left as soon as I could focus on something other than finding the nearest comfort station. I left so quickly, in fact, that I momentarily forgot my promise to Long Suffering Spouse. To induce her to go to school that morning -- she'd been reluctant to let me go by myself even when I reminded her she'd soon be taking lots of time off on my account -- I had solemnly assured her I'd call as soon as I was done with the CT scan. It's not that I didn't remember entirely. It's just that when I got into the car, it was after 8:00. I didn't remember that she'd told me I could call until 8:15 when her first class came in; I just remembered that school starts at 8:00. It would be alright, I rationalized to myself; we'd talk during her lunch break and I'd fill her in then. So I got my blood drawn and left the testing instructions for the internist so that he'd have them for our evening appointment. Then... I stopped home... it was on the way... and before pouring my morning coffee and hitting the road for the Loop, I stopped for a moment's private contemplation with the morning paper. The phone soon disturbed my reverie. We have it rigged so an answering machine cuts in after the fourth ring, so I was unsurprised when the clanging subsided. I was surprised when the ringing immediately started up again. And again. The germ of an idea began to form... I did what was necessary to be ready to answer the phone the next time it rang... mere seconds later, as I'd reluctantly predicted. I didn't say hello when I picked up the receiver. I said, instead, "I was delayed getting out of the CT scan. It was already too late to call when I got to the car." Fortunately, I had correctly divined the identity of the caller without even a glance at the Caller ID. She had a break between her first class and her second, and she'd spent nearly all of it on the phone trying to find me. Long Suffering Spouse was talking to me again by the time we left for the internist's office that evening. The less said about the four missed calls on the cell phone or the blistering message on my office phone... the better. The internist, for his part, was very upbeat... when we finally got to see him. We were shoehorned into an already busy evening call. We went through the requisite items on the physical in no time... and then Long Suffering Spouse moved the conversation to the outcome of the CT scan. Had he seen results yet? Indeed he had, the internist said, and everything was fine. He pulled the chart open and read from the report. There were just these two little spots on the liver, he said. Tiny, he said, indicating with his fingers for emphasis. They're probably nothing, he said, which prompted the immediate question in my wife's mind: If they're nothing, then why are they mentioned? I don't think she vocalized this thought at that time... but I heard about it all the way home, especially after the internist suggested how we should investigate this by getting a liver ultrasound. Oh, and a chest x-ray for good measure, he added. I didn't answer my wife's question then. So I was back at the hospital Thursday morning for the liver ultrasound and the operator was becoming frustrated. She had a slight East European accent, presumably Polish, but maybe Ukrainian. She was not a rookie at her craft; she told me that she'd read my CT report and looked at the scan in preparation for my visit, but she was having difficulty visualizing the alleged spots. She took photos at various points in the exam; it seemed as though she were taking a number of them. "How many photos do you take in the course of a regular exam?" I asked. "Eight or nine," she answered, "or as many as I need." "Do you edit the photos to a manageable number, or does someone else do that?" "No, all the photos become part of the report." "How many photos have you taken here so far?" "Twenty," she conceded. "But I can not find these spots." Soon thereafter I was back in the car -- and, yes, immediately on the phone to Long Suffering Spouse. "So what are the spots?" she asked. "Did they tell you anything?" I told her what I'd learned. "So why did they make you go through this?" she asked. My internist knows what I do for a living, I told her. It's not just him. They either won't touch you or they'll be extra special careful with you. It's just the lawyer's tax.